After the actual recovery of the mooring buoy and then the sensor frame, the long job of recovering the 4km of rope began and didn't finish until late in the evening. 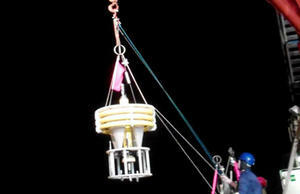 It was not until 22:30 that three PELAGRA buoys could be deployed on a trial mission. After the PELAGRA launches were completed the SAPS (Submersible Autonomous Pump Systems) were deployed. These are another way of sampling, by pumping water through filters for a programmable amount of time at a specific depth. When the SAPS are recovered the filters are preserved and analysed. The Megacorer was deployed then, and reached the sea floor to sample the sediments just after breakfast, so now it is being retrieved and the samples will be processed, so I will try to take some video footage of that. Our time out here is precious and every effort is being made to make use of every second.